BTL VANQUISH ME™ treatments are safe for all healthy Huntington Beach patients who want to take control of their core and improve the problem areas when exercise and diet have failed. 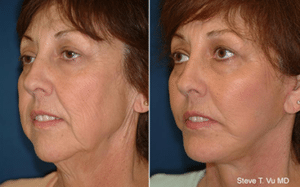 This is an option for those who desire aesthetic improvement without the cost and recovery time of surgery. The recommended number of treatments is between 4 to 6 sessions over the course of a few weeks. Treatments are usually scheduled 7 to 10 days apart and patients have reported results as soon as within a few weeks. Results may vary from patient to patient depending on many factors. Measurable circumferential reduction is common. For best results it is recommended to practice light to moderate exercise, such as walking, along with following a healthy diet and drinking plenty of water. The treated body part is located in the high-frequency electric field. The temperature increases to apoptic levels in the fat tissue while the surrounding tissue remains protected from apoptic temperature levels. The procedure is painless and 100% safe. To schedule a Vanquish ME™ consultation, contact our office in Huntington Beach at (714) 848-1133.